I have mentioned a few times before, that I really enjoy Clarins skin-care. I love the Daily Energizer Cream that I like applying in the mornings, the Pure Melt Cleansing Gel and their Lovely Lip Balm is everything! 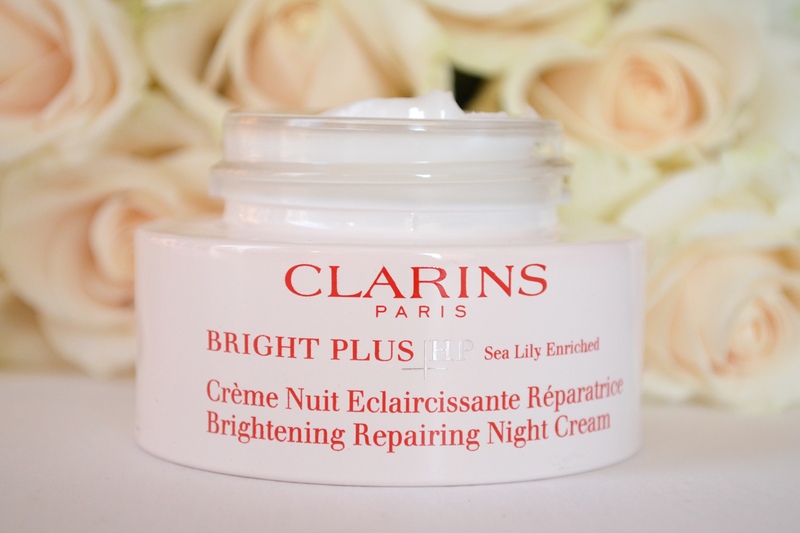 Recently I got introduced to the Clarins Bright Plus Range, with which for the first time the French skin care brand did local consumer research on.Dark spots are a concern to most women, and now according to the research 96% of South African women agree that their complexion look brighter*! The whole of the Bright Plus range consists of 3 products- The Hydrating Day Lotion (that also contains an SPF20), The Intensive Brightening Smoothing Serum and The Brightening Repairing Night Cream. All 3 of these products are enriched with Raspberry, Sea Lily and Alchemilla extracts that are the ones that fight the dark spots.The Night Cream also contains extracts of Parsley and Chamomile, while the Day Lotion has White Tea extracts and Serum contains Oat Sugars in it, to help smooth the skin. I got to try out the Brightening Repairing Night Cream, but then I also shared it with my mom, because she is the one who has dark spots problems and concerns. She has only been using it for 2 weeks, and already she says that she has noticed a visible improvement and her skin looks and feels lighter and more illuminated. We both also agree that the cream has a very lovely consistence, and applies like a dream onto your face. Plus it smells delicious, which is always a huge plus in my books. The cream is a little bit thick, but it absorbs into your skin quickly. However it is called a Night Cream for a reason, and I would suggest only applying it before bed time because the active ingredients in it work overnight and you wake up with a fresher looking skin. To celebrate this great range launching, today I am giving away a R1800 hamper consisting of all the products to one of you guys! To enter leave a comment and tell us, what is the brightest thing in your life? It could be your family, your job or even your skin! :) The answer is up to you! The competition will run until next week Thursday, after which I will get my mom to pick a winner. Good luck! My brightest thing in my life is my wonderful Mom who have raised 3 kids all by herself! The brightest thing in my life is having an attitude of gratitude! And of course our 8 furkids! I love your photography. Making the products look soooo pretty. 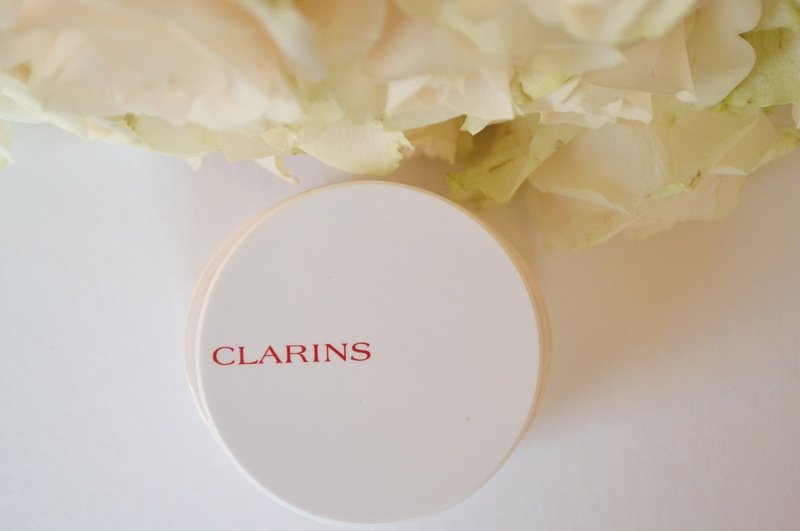 I adore Clarins products. Their lipgloss is to die for. Pick me! Pick ME! pretty please. My attitude is brightest and know that the secret of being happy is accepting where you are in life & making the most out of every day. The brightest thing in my life is my health. Without it I would have nothing. Feeling fit would go perfectly hand-in-hand with a smooth, even-toned, plump skin. Pick me! The brightest thing in my life is to wake up every morning and say thank you to the Lord for another day and how good He is for me. I know, because He picked me up when I was at my lowest. Then another brightest thing, is my family. So proud of them. The brightest thing in my life is my amazing family. I am blessed with the best support system. No matter what life throws at me,I can handle it all. My daughter’s smile and antics keep me on my toes and adds extra lustre to my day! I often think about what is the brightest thing in my life. My answer to this question is “love”, love from my family, friends and people around me. The brightest thing in my life is my Lipstick! It makes me feel more confident and glamorous when I am not… and it just brightens up my day. Clarins ceramide ultra liptick 01 is my favourite shade of red….. The brightest thing in my life is my hubby 🙂 we are polar opposite in every way. I am high stressed, super organised and all round pain in the backside while he always see the positive, relaxed and doesn’t let a thing get to him and I through him I see the bright side of any situation. The Brightest thing for me everyday is the soothing voice of my sweetheart Mom. I could be having the worst day, but listening to the sound of her voice with wise words illuminates the darkest of days in the brightest of ways. The brightest thing in my life would have to be my mom. She is so strong, and has been through so much in her life, but always manages to come out on top. Getting through infidelity, divorce, working full time while studying part time, all while raising my brother and I. We fight like cat and dog, and annoy eachother to death, but she is the brightest thing in my life. My little girl, I have only 1 child and I couldn’t ask for anything better in my life, she is perfect at 4, she is sweet and wants to hug everyone, always thinking about others which is just so sweet, she is precious! How to choose just one? Because three come to mind, my mommy, my husband and my daughters because all of them are shining lights in my life. My mommy because she’s my mom and she just gets me. My husband because he’s my best friend. But if I had to choose just one, it would be my girls because they are my impossible dream come true, after 7 years of infertility and 7 miscarriages, I never thought I’d be so abundantly blessed, twice, via adoption. The brightest thing in my life is the smile of my 4 year old daughter. She has a smile that light up the room and touches everyone who sees it. The brightest thing is my life is my husband 🙂 he makes me smile and happy. I thank God he is in my life. Been comfortable in my own skin…been loved by those I love. Seen my kids laugh.. Seen my husband happy.. God is the reason for happiness. The brightest thing in my life are my two brand new baby boys – after we were told we’d never have more children!!! The brightest thing in my life is my two daughters they can bring a smile to face no mater how bad a day I am having. My daughter to be is my brightest thing (I’m due at the end of the year). I am so looking forward to meeting this little one! The brightest thing in my life… My children. They know just what to say. Especially the time my daughter told me that I’m ‘beautiful, even though your face has spots and looks old’. She definitely made me laugh. Maybe Clarins Bright Plus can help with my ‘old and spotty’ face. The brightest thing in my life is my husband! He makes everything instantly better. After a rough day at work, I can count on him to make me feel better. His hugs are like chicken soup for the soul, his words motivating and uplifting, and his smile can brighten up any room! My brightest thing is my little son Arseni. He makes me laugh and he starts talking in 2 languages and make me smile ? all the time, when he kisses and hugs me I shine bright like a diamond ?, he is my bright future and the best of me. I love him with all my heart and he is my Sun and my Full Moon 24/7. it has to be my grandaughter! she brighttens up my life! My mam and dad. No matter what they always care for me. Brightest thing in my life is my husband first, because we have been married 20 years, have three lovely children, and have got through his depression and feel like our situation is finally coming together for us as we now move house and help our firstborn to university soon. My children are the brightest thing in my life. The brightest thing in my life, is my boyfriend. He lightens up my life, makes me very happy and picks me up when I’m down. The brightest thing in my life is family ? The brightest thing in my life is the animals I foster. They insist I get out of bed; they give unconditional love; they make me laugh and they are beautiful. My lovely daughter who has been so good to me through some very bad times. The brightest thing in my life is my family. It gives me a reason for everything. Brightest thing in my life is the everyday I am privileged to see. The brightest thing in my life is seeing the smile on my sons face. Yes,he was diagnosed with Autism when he was 5 years old. Yes, he is a tad bit different from other kids out there. But his smile is so beautiful and so pure that it is bright enough to light up the night sky. He is my anchor and my inspiration and his little heart has inspired me to become a psychologist. My son who has a heart of gold has ignited a dormant passion deep within me and I pray that I can make milestones for children who think differently than others. People don’t realise that children are all like stars, we just have to know how to nurture them so that they can shine at their brightest! My eye sight without it I would be lost as I would not be able to see my gorgeous boy grow and I would not be able to see all the other things that I take for granted. The brightest thing in my life is…wow, too many. My living arrangement is pretty sweet, my temporary fur babies are awesome, my successful two-thirds-life career change, and life in general – I see beauty everywhere! My two cats, they cheer me up every day no matter what! The brightest thing in my life right now is my future. ? I’ve been working hard and it’s finally starting to pay off. Hard work and long hours may not yield immediate results, but somewhere, sometime, someone WILL recognize what you’ve put in and you’ll get the break you deserve. My kids’ smiles are the brightest things! Right now the brightest thing in my life is my nephew, only a month old he’s been the best thing that has happened to my life in a long time and has definitely brought us closer. Plus he’s super tiny and just the cutest thing in the world. Family – and the time we spend together! The light of my life has to be my husband children and family, we have had a lot of sad times but we always make it through and each time we become a little closer and a lot stronger. still amazes me how you find room in your heart to love someone more than you already do………family truly is a magical thing and we should cherish it x. The brightest thing in my life is my marriage. Together for 20 years my Husband is my best friend, soul mate and trusted companion. I love him with all my heart and would crawl to the ends of the earth to be with him! Run on the beach with my basset hounds. The brightest thing in my life is my family 🙂 But also my wonderful dog who is always so happy to see me & I smile every time I look at her sleeping…which she does most of the time as she is almost 14 years old! The brightest things in my life are all my grandchildren, although I’m not supposed to have favourites!! My youngest daughter was diagnosed with cancer three months after getting married and against all odds she eventually had a beautiful little boy who is now 10, she has been given a 12 year clean bill of health and he is absolutely delightful. I can’t ask for more except a brighter skin, but then Clarins could do that for me. The brightest thing in my life is my wonderful husband. The brightest thing in my life is my girlfriend! The brightest thing in my life is my wonderful wife of two years. She has given me the most gorgeous little son. I am a very lucky man. I hope to win this special treat for her. The brightest thing in my life is my daughter who seems to always have a smile on her face and song in her heart. The brightest thing in my life, is music, it speaks the words they i cannot say. Cheer me up, when sky’s are grey. Or makes me in a good mood with positive words and up beat tempos. The smiles of my children. my sunshine is my niece… She is the most incredible soul I have met that just talking to her cheers me up. I can not imagine life without my sunshine. Love her to the moon & back. ? The brightest thing in my life is my garden. Everyone smiles when they see it. It is full of fragrance and colour, the birds, butterflies and bees give a never ending nature show and it is the place where I can totally unwind. My mother has to be the brightest thing in my life! My daughter the light of my life ! The brightest thing for me by far is making my family happy. Waking up to another day is the brightest thing in my life (if it’s pain free it’s an extra bonus)! The brightest thing in my life at the moment is my 10 week old baby granddaughter. She has a beautiful smile that always brightens my day. My lovely husband who I’ve been married to a year this Saturday. The brightest thing in my life would have to be my daughters, I thought I couldnt have children so I’m incredibly lucky to have two beautiful girls. The brightest thing in my life is my husband and our beautiful rescued cat and dog .. they truly are my sunshine, my happiness and my joy. The brightest thing in my life is my awesome husband thar helps me with so much housework that I cannot do due to fibromyalgia. ….he truly is a man a million ,not a lazy bone in his body ….he is the brightest part of my whole life …..and my late mom is the brightest star in heaven …and my cat Molly is my mini star ….. 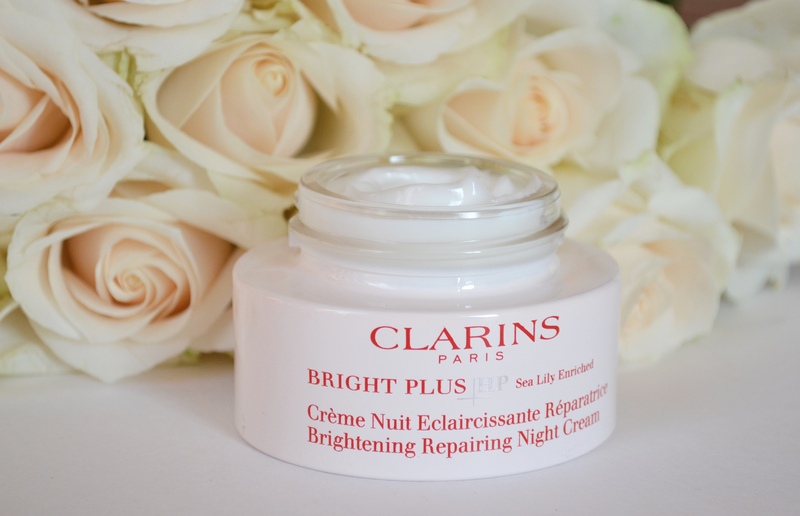 So where do I find the the Brightness in my day as Clarins promises me and so will deliver ! I wake in the morning to a simple cup of tea shared with quality time with my daughter , a BRIGHT beginning to my day ! I then spend the rest of my day “teaching ” hoping I can add the BRIGHTNESS the children bring to my life into theirs ! Coming home at the end of the day I find BRIGHTNESS in preparing a healthy meal for my family and then sharing it with them ! At the end of a long day I find BRIGHTNESS in giving THANKS to our creator for yet another BRIGHT day ! Definitely my daughter…nothing quite compares to the enormous amount of love, laughter and inspiration she brings into my life.